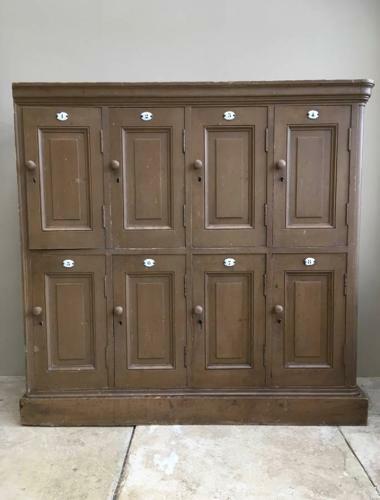 Wonderful Original Late Victorian Pine Bank of Eight Lockers in its Original Paint. It has all its original enamel number plaques 1-8 which are original & not the reproduction labels that you see. The paint is in very good condition. The lockers were against a wall on the left hand side so that end is flat the other end is panelled. There is no back..the wall was the back (I can however add a back if you prefer to keep the dust out) or your wall will be the new back. It is just perfect for shoes.